Man, I should’ve gotten some, they were only $5 😯 The most recent set on eBay sold for $255! I’m still confused though; this catalog says the pogs smell like pizza, but I haven’t heard one account of them ever actually smelling like pizza. If they did have a smell it’s probably worn off by now, but even back in the day the smelliness of the pogs was suspicious. Anybody have any insight into this? Anyway, this catalog was Nintendo Power’s summer 1995 Super Power Supplies Catalog. 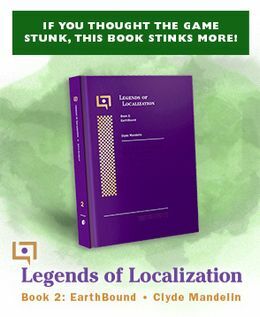 If you’re interested, you can see the whole catalog here. It’s great seeing all of these old magazine scans that you’ve been posting lately. I still have all my old issues of Nintendo Power and EGM in my closet, but it’s been such a long time since I’ve dug ’em out and looked through them. I just realized that if you used the two free Power Stamps (or whatever they were called) that were included in the catalog, you could’ve gotten the EB pogs for only $3. Yeah, these old articles and ads are cool. I’d like to see more if they still exist. I did have these pogs… Gave them all away years ago. They sort of smelled like pizza… Kind of a faded smell, cheese mostly. I have a “new” (unpunched) set and there is no scent on them. Old scratch and sniff things do have a certain smell to them, but this smells like nothing but cardboard. Likewise, there doesn’t seem to be any residue of the smelly stuff on them, so I would say that these things never did smell. Whoever put the catalog together likely assumed that it smelled like the air freshener, but as far as I can tell, these are just regular cardboard. Things like this remind me of how stupid and cheap Nintendo is. Dang, I wish they still had some of the things in that catalog for sale. Now that I’ve seen it though, it did trigger a memory. 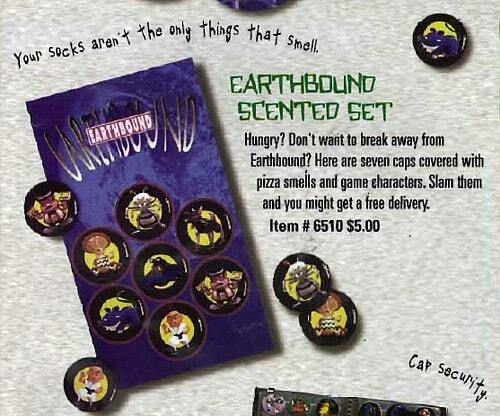 I think I do remember the EB pogs having some sort of smell. I vaguely remember scratching the rough and bumpy surface that was reminiscent of cardboard that had a scratch and sniff coating. Hm, weird. Wow, looking at that catalog was fun. Thanks for posting it. I would love a pair of those DK imitation RayBans. Thanks for posting the scan ‘mato! Now we know why these are so valuable, they sate your hunger at will. wow. pizza smelling pogs for $5.00. what could be better? I wonder what they mean by “Slam them and you might get a free delivery”?